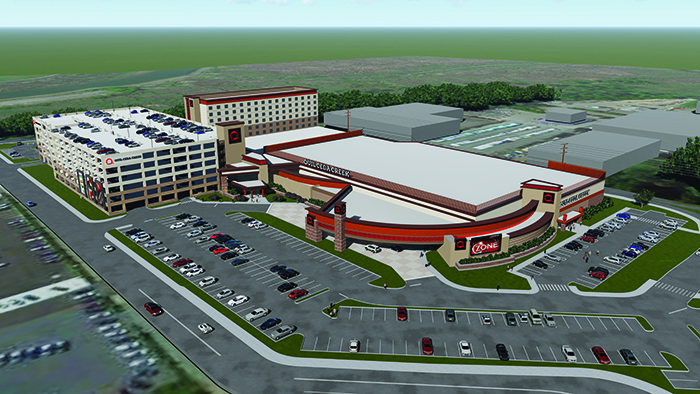 Concept rendering of the Quil Ceda Creek Casino. After months of delay, construction is again underway on the $125 million casino and parking garage that will replace the aging Quil Ceda Creek Casino (locally referred to as ‘the Q’). The lengthy pause in construction was primarily due to the Tulalip Tribes undergoing a strenuous process to replace the original general contractor, Tribal Designs/Wright Hotel Development. Andersen Construction is the new design-build contractor. Presently, Andersen Construction is starting with site work that includes soil improvement work and grading, installing concrete footings, and will soon start on the underground plumbing and electrical. The multi-million dollar project will relocate the Q facility from its current location to a fifteen-acre property across the street on Northeast 33rd. Replacing the Q Casino was based on a number of factors, the most prominent being a stagnant revenue stream that is unable to grow due to logistical and structural challenges posed by the current facility. Also, with an ever growing population, it is critical to generate more revenue in order to meet the costs associated with more and more Tulalip citizens. 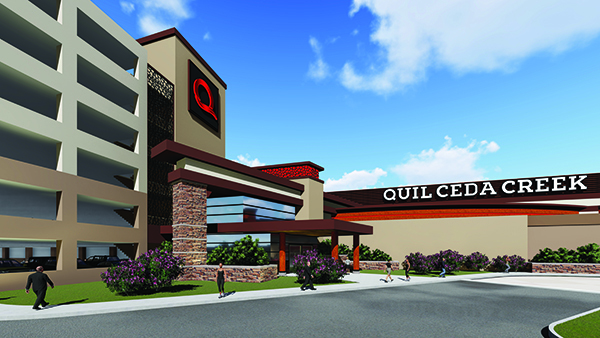 The new Q Casino will span 126,000 square feet and allow for 1,500 gaming machines, a lofty increase from the current 1,000 operating at the existing QCC facility. The 500 extra slot machines will bring in millions of additional gaming revenue annually. Besides the increase of slot machines, there will be expanded table games, an innovative dining hall experience with multiple cooked-to-order food venues, an upgraded entertainment venue, and a state of the art smoke elimination system included in the new locals casino. Current parking at the Quil Ceda Creek Casino has always been a nuisance for regulars. The new Q will solve that issue by having a parking garage that holds 1,068 stalls, plus surface parking for 684 vehicles. That’s total capacity for 700+ more vehicles than currently available. The design schematic leaves the option open for the opportunity to build on a hotel to complete a casino resort destination stay, like the Tulalip Resort Casino. “We have to maintain our competitive advantage by staying up to date with what’s going on in the gaming industry,” said Vice-Chairwoman Teri Gobin. “The Emerald Queen will be opening their new facility soon, Ilani recently had a renovation, and Snoqualmie is looking to add a second tower. That’s our competition and they all have or are going to build additional hotels. Potentially, an add-on hotel would feature 150 guest rooms, special event space and meeting facilities, while having recreation space that includes a pool, spa and exercise room. The Tribe is also investing in street improvements to enhance ease of access to the new casino. “We anticipate this property remaining very popular with our local customers and will also attract new gamers,” said Chairwoman Zackuse. The new Quil Ceda Creek Casino and parking garage is expected to open February 2021.